Major Eh Hser Hser, office manager of KNLA Brigade 7 told Karen News that their soldiers ambushed Burma army Light Infantry Battalion 547 on their way to frontlines areas. Major Eh Hser Hser confirmed there are no KNLA casualties. This is not the first time fighting in KNLA Brigade 7 area has targeted Burma army officers. 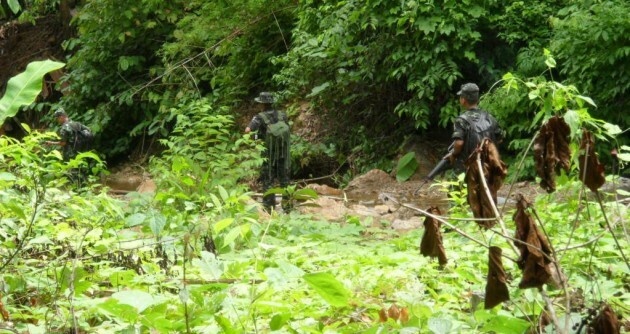 In other recent clashes, the KNLA also confirmed their operations killed senior officers. The Burma army in Karen state has been put under pressure from attacks by various Karen armed groups. On June 29, a renegade Border Guard Force, battalion 1012, led by Major Saw Beeh attacked the Burma army camp in Ka Ma Maunn village, Papun Township, on June 30, fighting between BGF fighters broke out near Myaing Gyi village while in the southern part of the state Democratic Karen Buddhist Army soldiers have been attacking Burma army units.